Some multivitamins claim to be the best for bodybuilders. Well, this Universal Nutrition Animal Pak review proves strength athletes and bodybuilders can benefit from a top-notch multivitamin. Achieving your long-term fitness goals has never been this easy. Six gram of protein per serving. Absurd amount for a multivitamin. Has eight of the essential amino acids (EAAs). Rare multivitamin which has this many. Excellent reputation. Customers swear by it. Other Ingredients: Dicalcium phosphate, whey protein concentrate (milk), glucose polymers, microcrystalline cellulose, arginine α-ketoglutarate, dessicated Argentinian liver (bovine), stearic acid, magnesium stearate, choline bitartrate, calcium carbonate, silicon dioxide, d-calcium pantothenate, lecithin (soy), carnitine fumarate, calcium citrate, alfalfa, rose hips, rice bran, parsley, burrock, pharmaceutical glaze. Powder: Take 1 to 2 scoops with 6-12 oz. of your beverage of choice with breakfast or any other meal. For those who compete or are training with higher intensity, two scoops is suggested. We hope you’ve read our B5 multivitamin reviews. We know these supplements will help fill those nutrition gaps efficiently. We’ve sized up some impressive athlete multivitamins long the way. Those which first come to mind include MuscleTech VitaMax Sport SX-7 Black Onyx, EFX Sports VitaDrive, and NOW Men’s Extreme Sports Multi. These will help ramp up your performance, for sure. Now, make way for Universal Nutrition Animal Pak – the multivitamin for bodybuilders. Customers have sung this supplement’s praises for years. Well, there’s a good chance we’ll jump on the bandwagon. When we first laid eyes on Universal Nutrition Animal Pak, we thought it’s one of the most unique bodybuilding multivitamins on the market. Universal Nutrition Animal Pak should give bodybuilders the competitive edge they need. The folks at Universal Nutrition correctly point out unchecked nutritional gaps can grow. That can lead to disastrous consequences on your performance at the gym. They also add bodybuilders and strength athletes “have higher nutritional requirements than regular athletes,” per their official website. When contest time draws near, bodybuilders go on calorie-restricted diets, which increase those nutrition gaps. The company also emphasizes the detrimental impact of these nutritional gaps on other bodybuilding supplements. For example, the lack of certain enzymes in the body renders these supplements ineffective. Universal Nutrition Animal Pak puts a stop to that. The manufacturer is confident in Universal Nutrition Animal Pak’s upside. Why do we say this? It dubs this multivitamin “The Cast-Iron Skillet Of Your Supplement Program,” per its official website. It’s a bold claim, but it seems legitimate. Universal Nutrition has a total of 64 ingredients (a number which gives Optimum Nutrition OPTI-MEN’s 76 ingredients a run for their money). The manufacturer classifies them into five categories. This was an excellent move because the consumer will know what the product can do for him. However, we were disappointed when we didn’t find any ISO Certification or “All-Natural” label on Universal Nutrition Animal Pak. It could be a sign this product contains synthetic ingredients. Watch out. Nonetheless, we have a good feeling Universal Nutrition Animal Pak will still exceed our expectations. We didn’t spot anything out of the ordinary when we sized up Universal Nutrition Animal Pak’s vitamin and mineral content. We have several takeaways here. First, EFX Sports VitaDrive is still the King of B Vitamins among the multivitamins we’ve reviewed. It clearly dominates in five of the seven B vitamin categories. This one’s a no-brainer. If you want a multivitamin with superior B vitamin content, EFX Sports VitaDrive is your best bet. It’s also clear Universal Nutrition Animal Pak has superior vitamin B7 content (100 percent of the daily value). You can see its overall B vitamin content isn’t too shabby. So, if you want a multivitamin which has great (not over-the-top) B vitamin content, this is a good choice. Notice the manufacturer didn’t put a premium on vitamin B12. Universal Nutrition Animal Pak (185 percent DV) pales in comparison to other athlete multivitamins. If you’re big on vitamin B12, you’re better off getting something else. Iron: A mineral which helps transport oxygen to the muscles. The harder the training, the greater the need for iron. Antioxidants (vitamin C, vitamin E, beta carotene, and selenium): These help ward off cellular damage. Calcium and vitamin D: These help maintain excellent bone, teeth, nerve, and muscle health. Plus, vitamin D helps regulate the immune system. Universal Nutrition Animal Pak doesn’t have supplemental iron. The good news: its Uni-Liver component makes up for that. More on this later. On the other hand, this product has solid amounts of vitamin C (1,667 percent DV), vitamin E (1,000 percent DV), and vitamin A (198 percent DV). These antioxidants should help bodybuilders keep cellular damage at bay. This supplement also has impressive calcium (200 percent DV) and vitamin D (170 percent DV) content. These will help shore up your teeth, muscles, bones, and nerves. Universal Nutrition Animal Pak has one glaring omission: vitamin K. This vitamin helps promote bone growth and regulate bone mineralization. Having ample amounts of vitamin K helps ward off injuries and shorten recovery time. It would have been better if Universal Nutrition Animal Pak had vitamin K. Nevertheless, its vitamin and mineral profile blew us away. It will surely help any hard-training bodybuilder conquer his fitness goals. If there’s one thing which sets Universal Nutrition Animal Pak from the rest of the field, it’s its Amino Acid Complex. We bet you won’t find any other multivitamin with 19 amino acids. That many is sure to make any bodybuilder’s eyes bulge out. Just so you know, the aforementioned Optimum Nutrition OPTI-MEN (one of the most popular men’s multivitamins today) has just eight amino acids. If amino acid content is your sole basis for choosing a multivitamin, Universal Nutrition Animal Pak is the runaway winner. 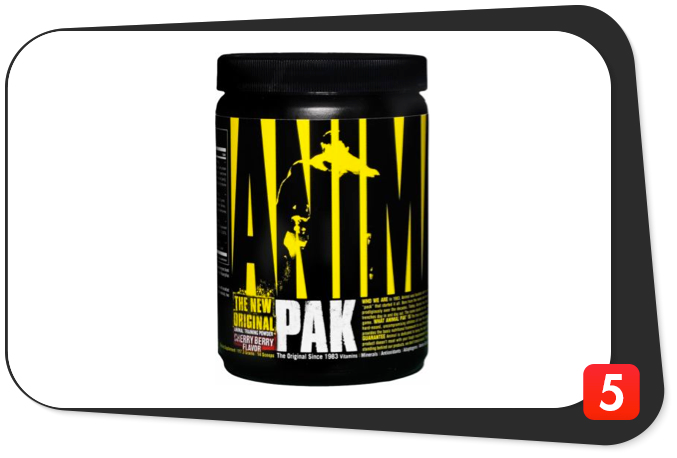 Get this: Universal Nutrition Animal Pak contains eight of the nine essential amino acids (EAAs). Remember, your body doesn’t synthesize these. You can only obtain them from whole foods or supplements. This multivitamin covers most of the bases. It gets better: this product contains all three branched-chain amino acids (BCAAs) leucine, isoleucine, and valine. We’re telling you, a multivitamin with 509 milligrams of leucine (the most anabolic amino acid) per serving is impressive. On that note, when you take a protein powder or post-workout supplement in tandem with this multivitamin, you will grow muscle mass and shorten your recovery time. Count on it. The folks at Universal Nutrition did a splendid job of formulating the Amino Acid Complex. It’s a solid selling point for bodybuilding enthusiasts. We also say it’s one of Universal Nutrition Animal Pak’s most unique features. Universal Nutrition Animal Pak’s Performance Complex has the components which will not only boost your performance at the gym, but your long-term health as well. Leading the charge are 4.08 grams of Uni-Liver per two-packet serving, which the manufacturer derived from Argentinian cattle. “One of the most nutritious supplements available to all bodybuilders, Uni-Liver contains important amino acids and key vitamins and minerals, including heme iron, riboflavin, folic acid, and B12,” per Universal Nutrition’s official website. We’re stoked this supplement has Uni-Liver. Bear in mind Golden Era of Bodybuilding icons took dessicated liver. It ramped up their red blood cell count, whetted their appetites, and helped them meet their iron needs. Like we said, Universal Nutrition Animal Pak does not have any supplemental iron content. However, its Uni-Liver component supplies bodybuilders with ample amounts of natural iron. We’re glad this multivitamin relies on natural iron. This mineral will help supply oxygen to the muscles for increased athletic performance. We’re certain the Performance Complex’s other components (carnitine, choline, hawthorne, inositol, milk thistle, etc.) will provide you with similar long-term health benefits. Score another point for Universal Nutrition Animal Pak. Any time a supplement helps ward off nasty free radicals, it’s a major plus. It’s clear Universal Nutrition Animal Pak can do that, and then some. The most abundant ingredients under this blend are citrus bioflavonoids, which take up one gram per serving. These help keep inflammation at bay, regulate blood vessel health, and maintain healthy cholesterol levels. We also like the inclusion of other time-tested health boosters such as alpha lipoic acid (ALA), CoQ10, grape seed extract, lutein, lycopene, and pine bark extract. Lutein, in particular, helps boost vision health. For its part, lycopene shores up your antioxidant protection. Put all of the ingredients under the Antioxidant Complex together, you’ve got an impressive shield against those nasty free radicals. “Athletes should not take supplements to get antioxidants; in fact, antioxidant vitamin supplements may be harmful,” per Dieticians of Canada’s official website. Take this blend for what it means: it will help improve nutrient bioavailability and absorption. When that happens, you will reap the full benefits of Universal Nutrition Animal Pak. The least familiar ingredient is Veg Peptase 2000, which the manufacturer describes as “an acid stable protease enzyme blend derived from the fermentation of non-GMO, nature-identical strains of Aspergillus niger and Bacillus subtilis.” This enzyme helps break down protein molecules into smaller peptides. It sure seems to us the Digestive Enzyme Complex has the full arsenal. You will be able to digest your macronutrients (carbs, protein, and fats) and micronutrients (vitamins and minerals) with ease. Calories, 40: Multivitamins rarely divulge their calorie content. However, Universal Nutrition Animal Pak does. Forty calories per two-pack serving isn’t over the top, by any means. Total carbohydrates, 4 g: This multivitamin isn’t a significant source of carbs at less than two percent of the daily value (a value of five percent or less has a low value). Dietary fiber, 2 g: Universal Nutrition Animal Pak is a rare multivitamin which yields this much dietary fiber. Granted, it’s not sky high by any means, but it’ll help. Protein, 6 g: Just where can you find a multivitamin which yields six grams of protein per serving? This is as rare as it gets. Twelve percent of the daily value for protein could set a record for this bodybuilding supplement category. Vitamin A (as carotenoids [b-carotene, a-carotene], acetate), 9,900 IU: This vitamin helps improve vision, strengthen bones, and increase muscle mass. Vitamin C (as ascorbic acid, ascorbyl palmitate), 1 g: Vitamin C is a powerful antioxidant which helps ward off the common cold, regulate blood pressure levels, improve cardiovascular function, and boost eye health. Plus, it helps produce collagen, the protein found in connective tissue. Universal Nutrition Animal Pak has an impressive 1,667 percent of the daily value for vitamin C.
Vitamin D (as cholecalciferol), 680 IU: This vitamin helps regulate bone, teeth, muscle, hormone, and nerve function. It also helps improve heart health and increase antioxidant protection. Vitamin E (as d-α, d-β, d-ϒ, d-Δ tocopherols & tocotrienols), 300 IU: This vitamin helps boost hydration, keep free radicals at bay, and shorten recovery time. This product’s vitamin E content packs a major wallop at 1,000 percent of the daily value. Thiamin (as mononitrate), 76 mg: Simply known as vitamin B1, this component helps improve heart health and ward off free radicals. An awesome 5,067 percent of the daily value should do the trick. Riboflavin, 76 mg: Vitamin B2 helps ramp up energy levels and regulate the immune and digestive systems. An insane 4,471 percent of the daily value is a sure bet. Niacin (as niacinamide), 82 mg: Vitamin B3 helps boost cardiovascular function and joint mobility. Four hundred percent of the daily value for vitamin B3 should go a long way. Vitamin B6 (as pyridoxine AKG, pyridoxine HCl), 180 mg: This is Universal Nutrition Animal Pak’s most abundant B vitamin at a whopping 9,000 percent of the daily value. Vitamin B6 helps keep homocysteine (a non-protein amino acid detrimental to heart health) levels in check for better heart health. Folic acid, 400 mcg: Vitamin B9 helps regulate cholesterol levels and boost cardiovascular function. A solid 100 percent of the daily value should make an impact. Vitamin B 12 (methylcobalamin, cyanocobalamin), 11 mcg: Just like vitamin B1, vitamin B12 helps improve heart health and boost energy levels. While Universal Nutrition Animal Pak’s 185 percent of the daily value for vitamin B12 should help, it’s one of the lowest we’ve seen among athlete multivitamins. Biotin, 300 mcg: Vitamin B7 helps improve skin, nail, and hair health. It also helps ward off inflammation and repair muscle tissue. Universal Nutrition Animal Pak’s 100 percent of the daily value for vitamin B7 is one of the highest among athlete multivitamins. Pantothenic acid, 76 mg: Vitamin B5 helps keep stress levels in check, regulate the immune system, increase stamina, and boost heart health. Universal Nutrition Animal Pak’s impressive 760 percent of the daily value for vitamin B5 should help you reap these benefits. Calcium, 2 g: This mineral helps boost heart health, regulate blood pressure levels, strengthen bones, and ward off free radicals. Phosphorus, 1,333 mg: This mineral helps regulate kidney function and energy flow, boost digestion, repair cells, and ward off fatigue. Iodine (from kelp), 150 mcg: This component helps regulate thyroid function and ward off bacterial activity. Magnesium (as oxide), 400 mg: This mineral helps regulate muscle and nerve function, improve heart health and sleep quality, promote healthy blood pressure levels, strengthen bones, ramp up testosterone levels, and boost the immune system. Zinc (as oxide), 30 mg: This mineral helps increase testosterone levels, improve sleep quality, boost weight loss, strengthen bones, and keep free radicals at bay. Selenium (as sodium selenite), 50 mcg: A mineral which helps regulate the immune system, ward off free radicals, boost heart health, and play a key role in thyroid hormone production. Copper (as sulfate), 600 mcg: This mineral helps increase energy and human growth hormone (HGH) levels – two perfect benefits for any bodybuilder. Manganese (as sulfate), 5 mg: This mineral plays a key role in connective tissue formation. It also helps ramp up testosterone levels. Chromium (as chloride), 60 mcg: A mineral which helps regulate insulin levels for more muscle growth and fat loss. Potassium (as sulfate), 200 mg: A mineral which helps regulate blood pressure and blood sugar levels, ward off muscle cramps, maintain optimal muscle and nerve function, and improve bone health. Alanine, 279 mg: An amino acid which helps convert glucose into energy, rid the liver of excess toxins, and maintain a positive nitrogen balance. Arginine, 1,213 mg: This amino acid is best known for its ability to improve blood flow. This results in increased vascularity and muscle pumps, improved nutrient uptake, and healthier blood pressure levels. Universal Nutrition Animal Pak ramped up its l-arginine levels for these reasons. Aspartic acid, 498 mg: Simply known as l-aspartate, this amino acid plays a key role in the Krebs Cycle. Here, the body synthesizes other amino acids such as arginine, lysine, methionine, threonine, and isoleucine. Cystine, 110 mg: An amino acid which plays a key role in the formation of skin, hair, bones, and connective tissue. Cystine also helps produce the powerful antioxidant glutathione. Glutamic acid, 653 mg: This is an excitatory neurotransmitter and precursor of glutamine and gamma-aminobutyric acid (GABA). Glutamic acid also helps metabolize sugars and fats. Glutamine, 174 mg: An amino acid which helps preserve muscle mass, ramp up HGH levels, boost gut health, and eliminate ammonia from the liver. Glycine, 180 mg: This non-essential amino acid helps create muscle tissue, boost energy levels, and increase antioxidant protection. Histidine, 92 mg: An amino acid which helps maintain optimal tissue health and improve sexual function. Isoeleucine (BCAA/EAA), 509 mg: This BCAA helps increase endurance, repair muscle tissue, and shorten recovery time. This much is optimal for a multivitamin. Leucine (BCAA/EAA), 509 mg: The most anabolic amino acid which helps kickstart the muscle protein synthesis process. Lysine (EAA), 418 mg: An essential amino acid which helps regulate immune system function. Methionine (EAA), 125 mg: An essential amino acid which helps eliminate excess fats and produce the powerful antioxidant glutathione. Phenylalanine (EAA), 192 mg: An essential amino acid which helps regulate the central nervous system (CNS) and enhance mood. Proline, 203 mg: An amino acid which helps produce collagen and cartilage, promote muscle and joint flexibility, and break down proteins. Serine, 250 mg: A non-essential amino acid which helps boost brain health and regulate the central nervous system (CNS). Threonine (EAA), 283 mg: An essential amino acid which helps maintain the body’s proper protein balance. Threonine is a precursor of glycine and serine, two amino acids which play a key role in producing muscle tissue and collagen. Tryptophan (EAA), 81 mg: An essential amino acid which helps improve sleep quality, quell anxiety, and maintain healthy weight. Tyrosine, 164 mg: This non-essential amino acid helps enhance mood, regulate the nervous system, and keep fatigue at bay. Valine (BCAA/EAA), 289 mg: A branched-chain amino acid (BCAA) which helps repair muscle tissue, increase energy levels, regulate the central nervous system (CNS), and ward off muscle breakdown. Uni-Liver, 4,080 mg: Simply known as dessicated liver, this ingredient is a natural source of iron. The said mineral helps transport oxygen to the muscles, which allows one to exercise longer and harder. We’re not surprised why it’s one of Universal Nutrition Animal Pak’s main ingredients. Carnitine, 25 mg: An amino acid which helps torch fat, boost heart health, increase muscle mass, and strengthen bones. Choline, 250 mg: A water-soluble nutrient which helps regulate the central nervous system (CNS), improve heart and liver function, boost memory, and increase exercise performance. Eleuthero (root), 1,750 mg: Simply known as Siberian ginseng, this herbal ingredient helps increase energy levels, enhance focus, quell anxiety, improve sleep quality, regulate the immune system, and ward off fatigue. Hawthorne (berry), 250 mg: This berry helps shore up heart health, quell anxiety, keep bad (LDL) cholesterol levels in check, ward off free radicals, improve sleep quality, and boost digestion. Inositol, 125 mg: A nutrient which helps improve sleep quality and quell anxiety. Milk thistle (seed), 500 mg: A flowering plant which helps detoxify the liver, keep free radicals at bay, regulate cholesterol and blood sugar levels, improve skin health, and slow down the aging process. Oriental ginseng (root), 250 mg: Also known as panax ginseng, this ingredient helps ramp up red blood cell production, keep bad (LDL) cholesterol levels in check, regulate blood sugar levels, and increase stamina. Para-aminobenzoic acid, 400 mg: This antioxidant helps improve skin, hair, and intestinal health. Pyridoxine α-ketoglutarate, 200 mg: This is a combination of vitamin B6 and its amino acid compound, alpha-ketoglutarate. The latter is a precursor of glutamine, which helps preserve muscle mass and increase HGH levels. Alpha lipoic acid (ALA), 100 mg: An antioxidant which helps ward off free radicals, boost heart health, and enhance the efficiency of vitamin C and vitamin E.
Citrus bioflavonoids (peel), 1,000 mg: These are biologically-active flavonoids which help utilize vitamin C in the body, improve the health of the capillaries, and ward off antioxidants and inflammation. CoenzymeQ10 (CoQ10), 5 mg: A coenzyme which helps boost heart health, increase energy and stamina, enhance cognitive function, keep fee radicals at bay, and improve vision and dental health. Grape seed extract, 50 mg: Grape seed extract helps boost oral health, enhance cognitive function, regulate blood sugar and blood pressure levels, and strengthen bones. Lutein, 1 mg: A carotenoid found in many vision supplements which helps protect the eyes from excessive ultraviolet rays. Lutein also helps ward off free radicals and inflammation, keep free radicals at bay, and improve cardiovascular function. Lycopene, 1 mg: A phytonutrient which helps improve heart health, ward off free radicals, and boost eye health. Pine bark extract, 200 mg: An ingredient which helps boost heart health and circulation, regulate cholesterol levels, and keep inflammation at bay. Bromelain, 100 mg: A natural ingredient found in pinapple which helps ward off inflammation, break down protein, and improve skin health. Inulin, 250 mg: A type of fiber which helps improve gut function, increase satiety, and boost heart health and calcium absorption. Lipase, 10 mg: A digestive enzyme which helps break down fats, regulate cholesterol levels, improve nutrient absorption, and boost weight loss. Pancreatin, 700 mg: A digestive enzyme which helps break down carbs, protein, and fats; regulate the immune system, and improve cardiovascular function. Papain, 64 mg: A natural ingredient found in papaya which helps break down protein, ward off inflammation, and shorten recovery time. VegPeptase 2000, 64 mg: An ingredient which helps break down protein molecules into smaller peptides. After a thorough analysis, we say Universal Nutrition Animal Pak is arguably the best multivitamin for bodybuilders. You can’t dispute the ingredient quality, dosage, and the results they produce. First off, can you name another multivitamin brand which has a solid six grams of whey protein concentrate per serving? Like we said, this much will raise any bodybuilder’s eyebrows. Throw in the ample amounts of leucine (509 milligrams per serving), you’ve got a product which complements your nutrient intake, training, and supplementation regimen perfectly. Don’t forget about Universal Nutrition Animal Pak’s essential amino acid (EAA) content – it contains eight of the nine EAAs. We’re telling you, it’s hard to find a multivitamin which has these. Better grab the opportunity. The vitamin and mineral amounts are also at par with other big-name athlete multivitamins on the market. They may not be the highest in the industry, but they will go a long way, for sure. We identified the key nutrients (iron, antioxidants, calcium, and vitamin D) which every hard-training athlete needs. Universal Nutrition covers all of these. We like the manufacturer’s inclusion of Uni-Liver, which is a natural source of iron. Remember, bodybuilders from the Golden Era supplemented with desiccated liver. Universal Nutrition Animal Pak has a bit of a Golden Era of Bodybuilding touch to it, which is awesome. The Amino Acid Complex is about as comprehensive as it gets. It’s the most complete amino acid blend we’ve seen among multivitamins. That’s saying a lot. On the other hand, the Performance Complex is sure to boost your longevity and long-term health. It has several natural ingredients which have an excellent track record. You also can’t go wrong with the Antioxidant Complex. A blend featuring the likes of ALA, citrus bioflavonoids, CoQ10, grape seed extract, lutein, lycopene, and pine bark extract bodes well for your long-term health as well. The Digestive Enzyme Complex ensures improved bioavailability for more efficient results. It just doesn’t get any better than that. Universal Nutrition Animal Pak also enjoys an excellent reputation among customers. They swear by it. We’re confident you will, too. On the flip side, this multivitamin doesn’t have vitamin K. This component helps promote bone growth, regulate bone mineralization, keep injuries at bay, and shorten recovery time. The good news: the other ingredients more than make up for it. The manufacturer also did a tremendous job in terms of transparency – it revealed all of the ingredient amounts. However, the Performance Complex, Amino Acid Complex, Antioxidant Complex, and Digestive Enzyme Complex are proprietary blends in the powdered version. That’s a bit of a head-scratcher, if you ask us. Not only that, but the powdered version also has fillers (sucralose, FD&C Red No. 40, and FD&C Blue No. 1). Skip this one, if you will. Get the packed version instead. Despite these shortcomings, Universal Nutrition Animal Pak is still a top-notch multivitamin. If the manufacturer can iron out the kinks in its powdered version, it’ll crush the competition, for sure. We agree with all of these claims. Universal Nutrition Animal Pak is a top-notch multivitamin for bodybuilders which should exceed your expectations. The manufacturer intended Universal Nutrition Animal Pak for competitive strength and power athletes, weightlifters, bodybuilders, and powerlifters who are at least 18 years of age. Their goals include smaller nutrition gaps, increased energy levels and protein synthesis, shorter recovery time, and long-term health. Universal Nutrition Animal Pak has 410 percent of the daily value for vitamin B3, which may cause niacin flush, “a burning, tingling sensation in the face and chest,” per the University of Maryland Medical Center’s official website. This multivitamin’s powdered version also contains sucralose, an artificial sweetener which may increase weight gain. Finally, the powdered version contains several artificial food colorings (FD&C Red No. 40 and FD&C Blue No. 1) which have several side effects. If these, or any other ingredient, make you feel doubtful, please consult your physician before buying Universal Nutrition Animal Pak. Impressive ingredients. Perfect for bodybuilders, weightlifters, powerlifters, and strength athletes. Six grams of protein per serving. A rarity for a bodybuilding multivitamin. Contains nutrients essential for athletes. Iron (from Uni-Liver), antioxidants, vitamin D, and calcium. Boasts of eight essential amino acids (EAAs). No other athlete multivitamin comes close. Performance Complex. Helps increase longevity and boost long-term health. Antioxidant Complex. Helps increase antioxidant protection. Digestive Enzyme Complex. Wide array of digestive enzymes for better overall results. Excellent reputation. Customers have sung this product’s praises. Two-delivery system. Comes in packed and powdered forms. Two flavors. Powdered version comes in Cherry Berry and Orange flavors. No vitamin K. Helps strengthen bones and shorten recovery time. Transparency. Powdered version has several proprietary blends. Thumbs down. If you’re into bodybuilding and keen on a multivitamin which will help you achieve your fitness goals, you should include Universal Nutrition Animal Pak in your shortlist. The ingredients speak for themselves – they pack a wallop. 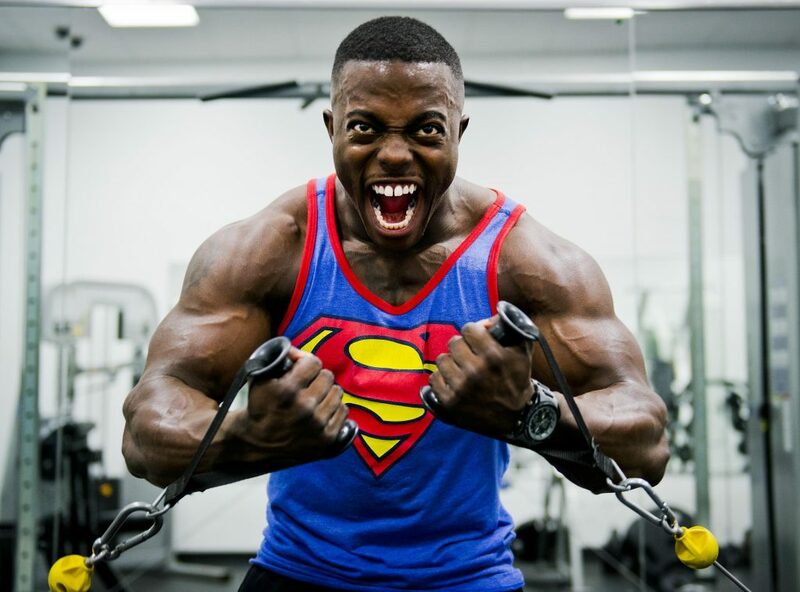 Not only will you become a better bodybuilder, but you will also improve your long-term health. If a multivitamin has five grams of protein and eight of the nine essential amino acids, that tells you something. While Universal Nutrition Amino Pak’s powdered version has some flaws, you’re better off getting the packed version. It will give you a faster return on your investment. Buy it, and see the difference it makes.